Men's soccer team hopes for playoff glory. Photo by Martina Marien. The Cape Breton Capers finished atop the league and can boast a No. 2 ranking in the CIS Top 10 as of Oct. 25 because of it. The Capers’ only defeat came in mid-October against Moncton. Cape Breton made it this far in no small part to their three-pronged attack of Keishan Bean, Ian Greedy and Shayne Hollis. The trio counted 31 goals this season. The entire Capers squad managed to score three goals or more in eight of their 13 games this year, which means any team hoping to compete must answer their talented attack. Although their main scorers are a major part of their success, Cape Breton’s defence cannot be ignored. The Capers only allowed 15 goals and never conceded more than two a game. Ryan Lewars, older brother of Dal striker Tyler, is a strong physical presence manning the Capers’ backline. Finishing first, the Capers earned a direct route to Victoria, B.C. for the CIS championships and a bye to the AUS semifinals on Nov. 5 where they await a challenger from the quarterfinals. The UPEI Panthers surprised everyone when they ended the season with a semifinal bye. The Panthers did so by earning solid points against all of the league’s big teams with strong defensive play. They had one win, two ties and a loss on the year against Dalhousie, Saint Mary’s, St. FX and Cape Breton for a total of five points, and grabbed six more from Moncton. They have shown they know how to get the job done and no team should expect an easy match-up against them. Eight of their 13 games were low-scoring contests with both teams unable to score more than two. Jared Murphy tops their scoring chart with seven goals, four of which were game-winners, making him a definite threat on the pitch. The Panthers will meet the winner of St. FX/SMU. St. FX had a strong season. Coming off last year’s disappointing loss in the semis, they were definitely looking for some redemption, and prevailed. Fifth-year Czech Republic midfielder Michael Marousek leads the way for the X-Men, topping the team with 12 goals. He will play a major part in any success St. FX has in Sydney. Centre-back Miroslav Novac cannot be forgotten either. Standing at a towering 6’7” he is a force to be reckoned with. Aerial attacks are mostly benign against the fifth-year as he soars over every striker in the league and can match most for speed as well. The X-Men only conceded 16 goals this season and he is a top reason why. The X-Men play Nov. 4 in the quarterfinals against a strong Saint Mary’s team, despite the Huskies’ disheartening sixth-place standing. If St. FX wins, they have a semifinal date with UPEI. After Kerry Weymann’s season-ending injury, fifth-year keeper Ben Ur, the other co-captain, was left to lead a young Tigers team. Ur would succeed in the role, making highlight reel saves and even finding the time to score his second career goal as the Tigers’ backline found its footing. The AUS first team all-star candidate will play a large part in how Dal fares in the playoffs. Rookie Bezick Evraire will be counted on to keep providing for strikers Julian Perrotta, who led the team with five goals, and Tyler Lewars. Evraire has found his niche as a holding striker, picking out the off ball runs of Lewars and Perrotta with ease. The 17-year-old must remain creative if the Tigers want to go deep this weekend. Dal will also rely on centre-back Nick Persichino and defensive midfielder Phillip Parsons, both new transfers. Persichino is strong in the tackle, can ping a long ball with great accuracy and is always a vocal leader on the field. Parsons, meanwhile, has been breaking up opposing midfields all season with partner Nathan Rogers. The Tigers must continue their strong defensive play, while hoping Lewars, Evraire and Perrotta can create their own Caper-esque three-pronged attack, if a berth to the national championships is going to happen. Dal kicks off the playoffs Nov. 4 against Moncton in the quarterfinals. The Tigers beat the Aigles Bleus 2 – 1 earlier this fall. If Dal manages a victory, they face CBU in the semis. 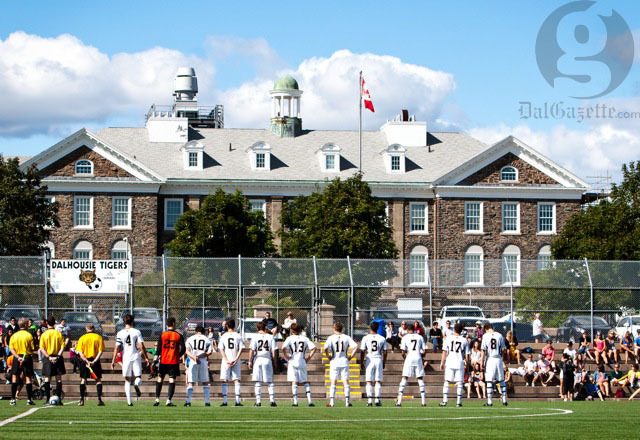 Atlantic Canada’s top francophone university enters the playoffs to a repeat of last year’s quarterfinal match against Dalhousie. After beating Memorial 3 – 2 in the season’s final game, Moncton took the fifth seed away from Saint Mary’s. The third highest scoring team in the AUS with 21, Moncton must address their defensive concerns. They conceded 22 goals, the most of any postseason team. Against the other five playoff squads, Moncton has a 1-4-1 record, scoring six and allowing 14. It will be interesting to see who gets the start in net against the Tigers. The goaltending duo of Samuel Charron and Arnaud St-Jacques split time, recording a total of three shutouts. The Aigles Bleus has every opportunity to surprise. They have the offensive punch, but it will come down to whether they can clean up their defensive play. They could be looking for a rematch against Cape Breton if they win, the only team also in the playoffs Moncton has a victory against. After a much-needed win against Dal Oct. 26, the Saint Mary’s Huskies could only manage a point in their final two games of the season. The disappointing conclusion to their season leaves the Huskies holding onto the final playoff berth in the league. Despite their frustrating season, the defending AUS champs and CIS bronze medalists cannot be overlooked. Possibly stronger than last year with the addition of ex-USL midfielder and former national team member Derek Gaudet, the Huskies should have confidence coming in. The Huskies did themselves no favours finishing as the sixth seed. The Nov. 4 quarterfinal between SMU and St. FX will definitely be one to watch as neither team wants to be the first big team knocked out. Considering the strength and depth of the Huskies, if they manage to get hot, they are the team to fear. If they can pull out the win on Friday, they face the No. 2 ranked Panthers in the semis.